Despite the fact that this blog post may be a few days late, I’m just glad I remembered before I went out of town to Michigan this weekend to visit my daughter and son-in-law. Last weekend had me traveling to both Fernald Preserve and Gilmore Ponds. And since I have some serious holes in my January list I had to make the most of this long weekend. Unfortunately I was only able to tick off 6 new species, which now brings my total for the month to a paltry 68. At the beginning of every new year I search for new blogs that follow the exploits of the big year birder. Last year it was Noah Stryker and his record setting world big year, and this year I’ve found 3 blogs which I’ll follow. In the past the most big year blogs I’ll follow at one time is two, however the format that each big year birder is using this time is a little different. The first “Big Year Blog” I’m following is “Olaf’s Bad Weather Big Year” This is your traditional big year. One man against the elements, time, flight delays, bad luck, good luck, bad hotels, and equally bad hotels, chasing after the record total of ABA birds in North America. With impressive numbers so far, and loads of pictures, it can be a struggle reading this blog. I don’t consider myself the best of writers by any stretch of the imagination, however I do re-read each blog post and try to correct any spelling or grammar error. It would do Olaf well to click on the “spelling and grammar check” button prior to publishing. Despite that, it’s a great little blog and well worth following, just for the sake of seeing how close he gets to Neil Hayward, and Sandy Komito. The next big year blog I’m following is “Lynn Barber’s Alaska Big Year“. This is the one I’m most interested in. If you’re not familiar with Lynn Barber, she’s one outstanding birder. Besides being a regular contributor to the “ABA Blog“, she did a Texas Big Year in 2003, and 2005, where her record of 522 species still stands. Her ABA Big Year in 2008 produced 723 species. Her book “Extreme Birder: One Women’s Big Year” takes the reader on her ABA Big Year as she recounts that incredible year. And in 2011, while a resident of South Dakota, she posted 350 species for her SD Big Year. Now she’s living in Alaska and doing her Alaska Big year, while I eagerly await for each and every posting. I would highly recommend this blog to follow, especially if you only have time to follow one blog, this would be the one. The 3rd and final blog is really different than any big years I’ve heard of, and it’s being brought to you by none other than Greg Miller. Yes, the same Greg Miller who who was one of the three main characters in the book and movie titled “The Big Year”. But this time Greg is doing his big year a little differently. Instead of traveling all over North America willy-nilly searching frantically for every bird, including rarities, he’s doing his big year as a series of 11 tours. Titled “Greg Miller: 2016 Big Year Tours“, Greg has set up these tours so others can join him for a week of all out birding fun. Each tour destination has already been determined, with a set price $1,750.00 per tour. You do save a few bucks if you book multiple tours. And with the first tour finished, their Southern California leg netted them 208 species. Quite a respectable number. So this is what I’m reading this year, how about you? Two trips out into the cold this weekend yielded me an additional 6 new birds for January. Saturday I visited Fernald Preserve, which is a sure thing to find Northern Harriers and clean up on a few ducks absent from the list. Then Sunday I was off to Gilmore Ponds where I struck out totally on any new birds. Other than any deep reservoir or quarry will be totally ice free, everything else from what I’ve observed are all frozen over. Being only the second weekend in January, and with the change in the weather looming with rain turning to snow overnight the need to get out an do some birding was imperative if I was going to make a dent into this 100 species challenge. And since 2 eyes are always better than one I picked up Jon at 8:00 am and once again re-visited some of the same locations David and I went to last Saturday. So instead of boring you with all the details of the day, I’ll give you a run down of the species seen. A few years back I drove to Armleder Park to try and pick up my lifer Short-eared Owl. The local buzz in the birding world was that it was a dependable location as long as you waited it out till evening. So one evening I waited and got some pretty terrible looks at some Short-eared Owls as the flew around the park. But it was a lifer, so I ticked it off. Since then I’ve seen them around the Tri-state, and actually close to a dozen a few years back when I first made my January 100 species. So yesterday I made my way back to Armleder Park after work in hopes of seeing some more. Once again the buzz around town was that they were pretty consistent right after sun down. So as I waited with frozen feet, 10 other birders were waited for when the owls left the cover of the overgrown field and took to the air. And they did, all 8 of them. Unfortunately since I didn’t have my camera, no photos. As you now the American Birding Association has this wonderful blog. 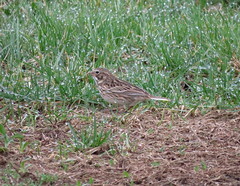 And every week or so they post a Rare Bird Alert for all over the country. Well guess who’s photo from my own Flickr page made the alert page with the Western Grebe I located last weekend. I hate to gloat, but I’m rather proud of the find. The URL for the ABA Blog is below. “January 100 Species Challenge”…with a bit of a surprise. Needing to pad my already dismal January list, I made for Spring Valley Wildlife Area with my oldest son David in tow. It’s always nice to go out birding with someone else but when it’s your own son or daughter it always makes it special. Plus it gives you someone to talk to, and another set of eyes which will prove to be valuable later on. The turnoff from Rt. 42 north of Waynesville Ohio provides distant looks at a couple of gravel quarries which can hold plenty of waterfowl. I was able to tick off a few ducks which was a huge improvement over yesterday. Despite these few ducks, numbers were real low overall. When we drove closer to Spring Valley we heard more shotgun firings all around us. It turned out that duck hunting was still in progress and not wanting to be mistaken for a over-stuffed goose, I donned my blaze orange vest and forged ahead down the trail. We were able to pick up just a few more birds for the count, but nothing in numbers. We walked a portion of the Loveland Bike Trail towards a Bald Eagle nest that I knew about. No Eagle. Other than a small scattering on American Tree Sparrows, a lone Belted Kingfisher, and a Pileated Woodpecker, Spring Valley was bird quiet. David wanted to get home by about 1:00 pm, and after looking at my clock I decided to cruise around Caesar Creek Lake and hope some of my hot spots held any new birds. Our first stop was Mounds Road at the northern end of the lake. Lake levels were up and with that no mud flats, and no birds. Time to head home was fast approaching so I decided to make just one more stop at my favorite spot on the lake, Harveysburg Road. As usual the wind was kicking up and after a quick scan for anything afloat I was beginning to feel this was going to be a brief visit. This is a real good spot for Common Loons, and my heart was sinking for the lack of waterfowl. Then I spotted something…way off in the distance. Nothing more than a black speck through my bins. I swung my spotting scope around and got on the bird…WHAT THE HELL! Despite the cold, the heat shimmer coming off the water was distorting things, other than my reeling brain as I tried to come to grasps with this rarity that I discovered. First thing to do is get David on this bird so I have an alibi that I’m not nuts just in case the bird flies away or blown away by a hunter. I pull out my new smart phone and hand it to David an have him open up one of my 4 bird guide apps I’ve installed. Too big to be a Horned Grebe, plus the bill is yellowish and slightly turned up. The black cap extends below the eye so that rules out a Clark’s Grebe. Western Grebe for sure. 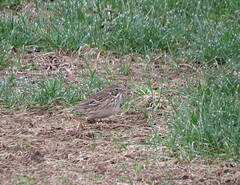 Now I need to make a few phone calls to my birding buddies and try to get more eyes on this bird. In the mean time the bird starts to actively feed. Diving and coming up somewhere totally different. We can’t lose sight of this bird till someone else shows up. 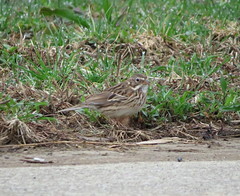 A friend of mine posts the sighting on the Facebook Ohio Rare Bird Alert, so things should start to hop. One of my birder friends I called, who turns out to be a cracker jack photographer, shows up and gets on the bird. It’s moving further away as it feeds. A few more people show up, and it’s my turn to depart totally excited about this discovery. Believe it or not the Grebe did come closer, so I was able for some better diagnostic shots. So with the 32 birds yesterday, and the 13 today, my January total is 45.